This November 27, 2015, the day after Thanksgiving, millions of Americans will kick off the holiday shopping season with what has become a "Black Friday" tradition: waking up bleary-eyed in the early morning and journeying (hopefully with coffee in hand) to the closest mall. Familiar though it may be, this Black Friday tradition shows signs of changing. Last year, around 87 million people visited stores on Black Friday, but a substantial number of these "visits" were online. According to the National Retail Federation, average consumers believe that they will do 46 percent of their holiday shopping online in 2015, and forecasters expect that number to grow annually as more and more Americans opt to stay home and avoid seasonal crowds entirely. The shift in Americans' Black Friday shopping habits reflects a larger trend within American culture: while shopping has been a favorite American pastime since the 1800s, the way Americans shop has changed dramatically. Historians study the transformation in Americans’ shopping habits (what scholars refer to as "consumption") using a variety of sources, but some of the most interesting are popular toys. Board games are particularly useful in this regard because, unlike other toys, they give the people who play them explicit rules and goals. In effect, board games teach people (especially young people) how to shop, reflecting and reinforcing the values of consumer culture. Shopping board games can be dated back to the 1800s. 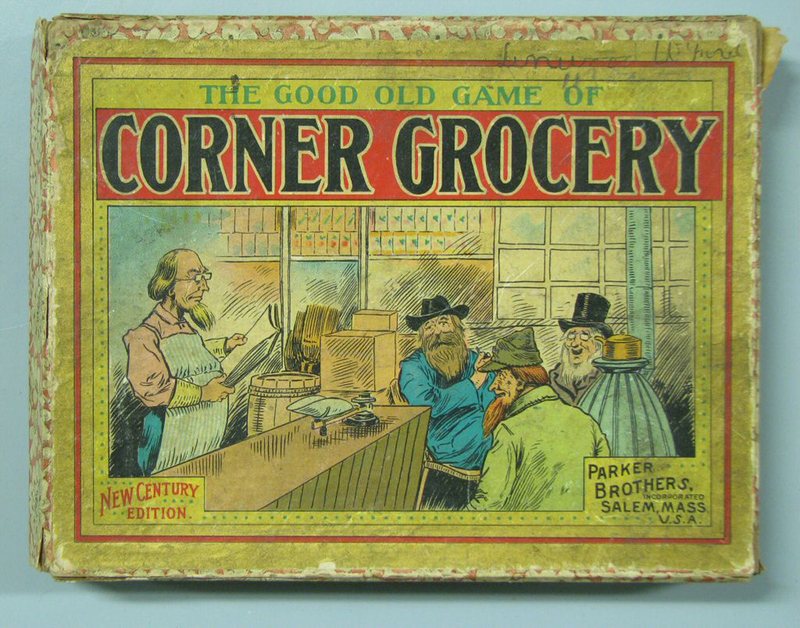 The Good Old Game of Corner Grocery, patented in 1887 by George S. Parker (of later Parker Brothers fame), was a nostalgic recreation of what shopping had been like before mass production, when the majority of Americans still bought their goods from small shops or independent wholesalers. Unlike later shopping games, the true adversary in Corner Grocery was uncertainty. At the start of every round, players did not know how much money they would have to use, or even which goods would be available for purchase. 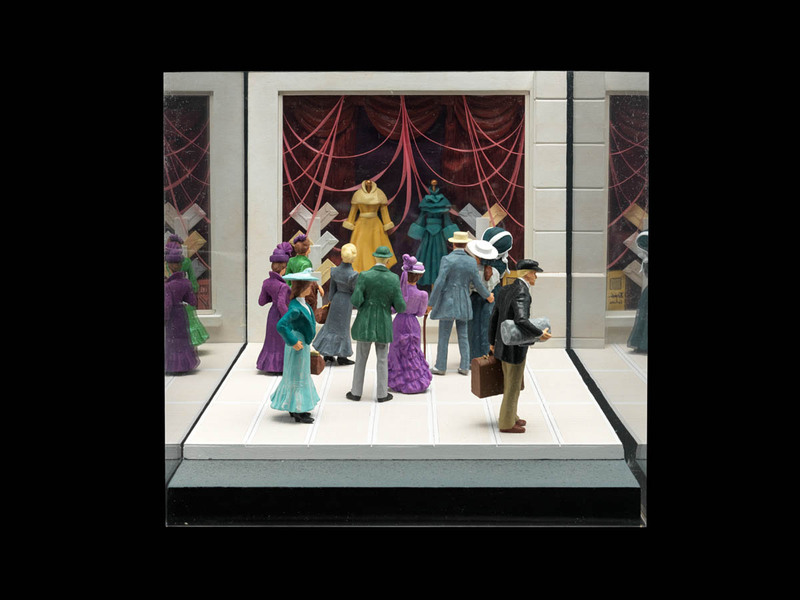 Though it came out only a decade later, The Game of Playing Department Store (created by McLoughlin Bros., Inc.) heralded a vastly different style of shopping, one that was taking hold in American cities. Instead of a simple general store, players were transported to a vast downtown department store modeled after one of the many "palaces of consumption" that were built in urban centers across the country in the late 1800s. While the overall goal of the game stayed the same (spend money wisely in order to collect more goods than your opponents), players now had a cornucopia of luxury products to choose from, all neatly divided into different departments like "drygoods" and "hosiery." Fresh seafood, ready-to-wear clothes, and toys (including board games!) were just a few of the items that players could choose between as they wandered through the imaginary store. Park and Shop, created in the early 1950s, shows how dramatically Americans' shopping habits could change in 50 years. Instead of walking through a busy department store or vying for goods at a general store, the game asked players to climb into their cars and race around town, driving from store to store in order to complete their shopping list before their opponents. Players were rewarded for securing the best parking spots and reducing the number of "steps" it took their pedestrian tokens to walk to each retailer. Americans from an earlier era would have been confused by some of the hazards Park and Shop players had to avoid during their shopping trips: fender benders, empty gas tanks, and impromptu bowling matches could easily cost a player his or her turn. 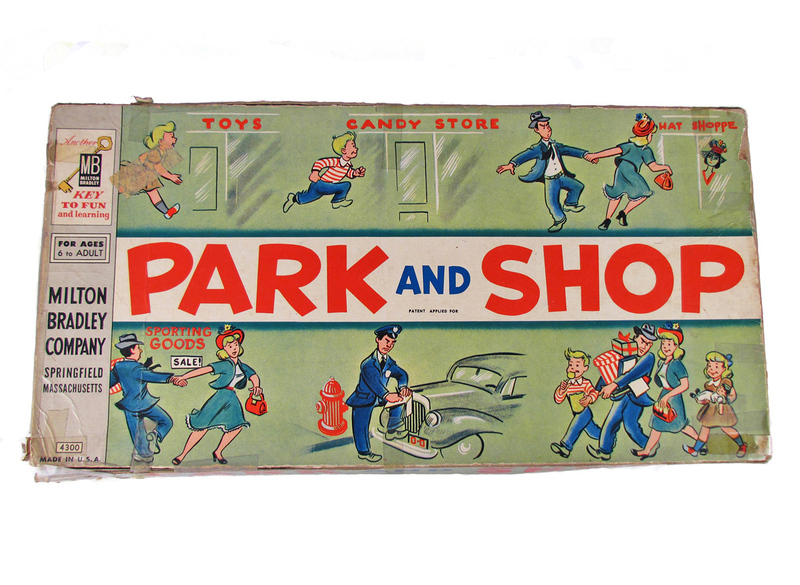 The origins of Park and Shop are a reminder that board games could be both prescriptive and descriptive. Developed by newspaper artist Campe B. Euwer and heavily promoted by the paper's owner, Donald Miller, Park and Shop was actually a clever attempt to promote a new parking system developed by merchants in Allentown, Pennsylvania. Fearful that their customers would abandon Allentown's downtown shopping district in favor of new and convenient strip-malls and stores at the edge of town, 48 merchants banded together in 1947 to create Park & Shop, Inc. By 1949 their corporation had purchased 10 public parking lots, and customers who shopped at participating stores were rewarded with four hours of free parking. Park and Shop drove home the merchants' message that shopping downtown could still be both fast and fun. 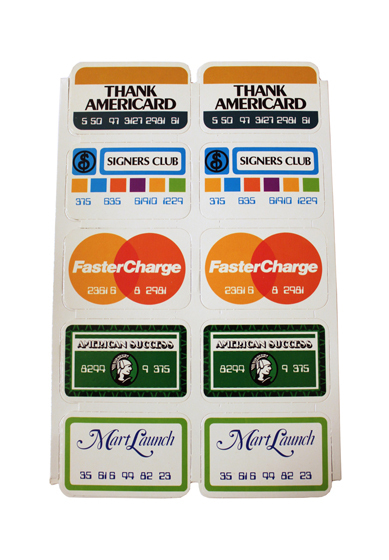 Few technologies have had as much of an impact on Americans' consumptive habits as credit cards. First introduced in the 1950s, credit card usage exploded in the 1980s, and the challenge of shopping with credit became a new dynamic for board games to explore. 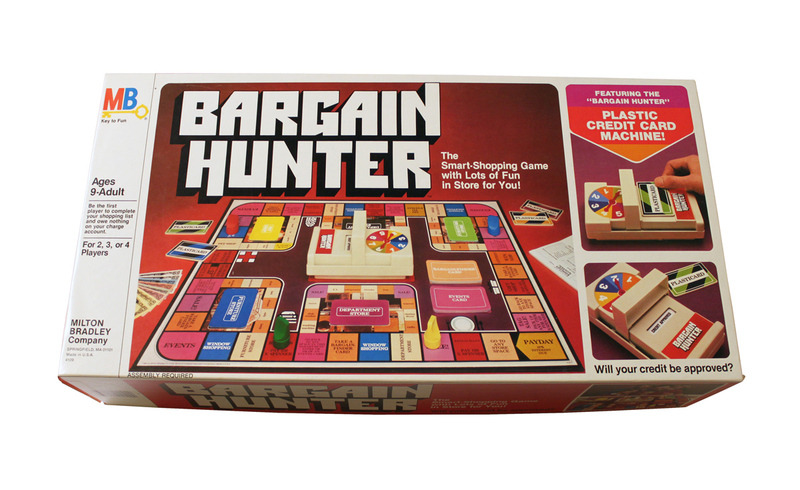 In Bargain Hunter, released in 1981 by Milton Bradley, players raced to furnish their new apartments with necessary items (which, interestingly, included not one but two pets). Perhaps unsurprisingly given that the game was released during a recession, Bargain Hunter made leveraging debt and comparison shopping essential strategies for winning. The prices for various products fluctuated wildly throughout the game, and players could take advantage of sudden sales by paying for their purchases with a credit card. (Players could borrow up to $1,000 before the game decided that they were in "Financial Disaster" and forced them to stop shopping.) 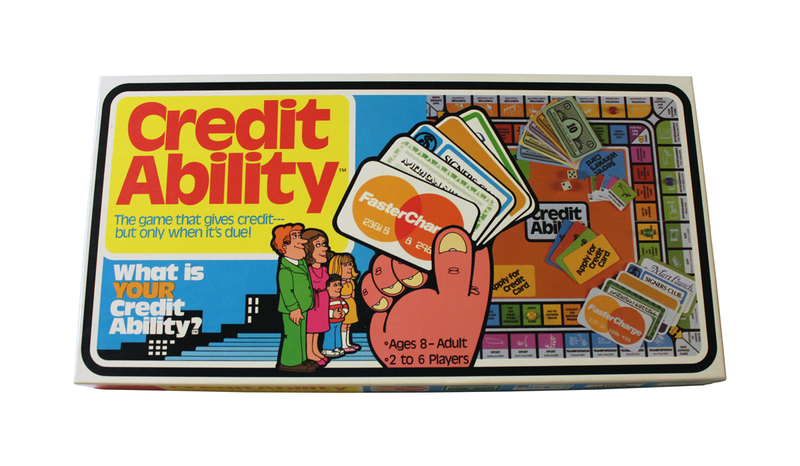 Other credit card-based board games from the period, such as Ungame's 1980 title Credit Ability, marketed themselves as educational tools for teachers. On the back of the game box, a special note addressed to teachers promised that Credit Ability would teach their students "valuable consumer skills" as they learned "some of the hazards as well as the delights of buying with credit cards." For more than a century, shopping has proven to be an enduring source of inspiration for board games, and while these toys are easy to overlook, they have shaped how generations of Americans understand consumption: what they should buy, how they should buy it, and what meanings they should attach to the experience of shopping. As more and more people choose to do their shopping online and new forms of currency replace the cash and credit systems we've grown familiar with, it will be fascinating to see what game makers think of next.